Every year between Thanksgiving and Christmas on the weekends, the Cow Palace in San Francisco is transformed into the streets of London, circa 1840's for their annual Dickens Fair. The public is invited to partake in the Christmas revelry and cheer. There are vendors selling everything from meat pies to corsets, actors roaming the "streets", shows, and a ball that lasts all day. There were 5 of us who went this year: my husband, daughter and I as well as two of our friends. We stayed at a Comfort Inn just a few miles from the fair location. It was a great hotel. We especially enjoyed the continental breakfasts and the hot tub. Especially the hot tub! But I digress. Enjoy the following pictures from our time at the Great Dickens Christmas Fair! Enjoying breakfast in our pajamas before heading back to the room to get dressed. Four modern-day misses ready for the hot tub the night before fair. Four modern-day misses being transformed into their 19th century counterparts. Another Fair patron dressed in Steampunk glory. We headed outside to get a breath of fresh air after being whisked around the dance floor and decided it was a good time to head back to the van for lunch anyway. We happened to park next to a lamp post and this huge concrete block. It actually made for a serviceable picnic table and bench. Joe telling a story of his adventures already that morning. Back inside spending time in the children's area. That's one of the things I love about Dickens - it's kid friendliness. I cannot believe that Sara is still wearing this dress. I made it for her over 2 years ago. The pictures of her from Dickens Fair in 2008 are just too cute. Luckily I made it with a large hem so it could be let out. But this time I also had to pin it with a safety pin instead of using the hooks and eyes. She wore it just fine a month ago for a Victorian Tea, but it was just too tight for an all-day event. She's got one more event to get through next week, then we'll start planning her next outfit. And then for a price, she could dip them in colored wax and take them home. 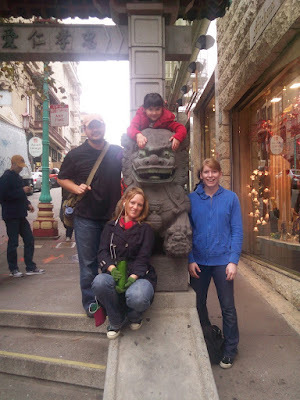 We went to a showing of "Cinderella and Aladdin Meet the Monkey King". It was cute and fun, but rather interesting. It was as if during the last 20 minutes someone had thrown a bunch of stuff in the script to make the thing last a full hour. And as if they were drunk or high while doing it. At least it was clean and kid friendly. And, according to Joe, quite conducive to a nice little nap. After the show, we took Sara on a Safari. Here she is waiting her turn. She got to ride the giraffe. Btw, notice her stockings? My little girl is growing up. She outgrew her tights but I didn't realize that until we were dressed and ready to go. So I cut the legs off the tights and used ribbons as garters to keep them up. So authentic and it worked great. They didn't fall down once all day! We also watched a juggling show. And then we went to tea at Cuthberts Tea House inside the fair. We barely got a reservation. By the time I got our names on the list (40 minutes after opening), they only had reservations left for one time slot. But, it turned out perfectly, since it was for 5:15 and we were all getting hungry by then, but would not be eating dinner until we got back to the hotel around 8 o'clock that night. I am so blessed to have such a wonderful husband who enjoys doing all this stuff with me. This was Deena's first time at Dickens. She did not sit out one single dance if she was anywhere in the vicinity of Fezziwig's Ball. Danae also was a very popular lady on the dance floor. The Secret Sisterhood of the Striped Sockeds strikes again! This baby carriage was in use by one of the actors. It belongs in the Dickens Fair "family" and gets passed on to a family who needs it each year. Sara finally got over her shyness enough to go out on the dance floor with a bunch of other kids and a few of the actors to "dance." Deena dancing with a most persistent admirer. We hadn't the heart to tell him that she's married. Sara "waltzing" with a group of young girls. I was amazed at how well these little ones stayed in time to the music. We closed the place down at 7pm. We had been there for over 7.5 hours. It was such an amazing day. Sara did the best she's ever done and already talks about going back next year. Next year we are thinking about going Steampunk. We'll see how that goes. I just had to include this one. It looks like once of those satirical cartoons of the 1800's. Did I mention we loved the hot tub at our hotel? Being in San Francisco, we took the opportunity to do some Christmas shopping and sightseeing in Chinatown. 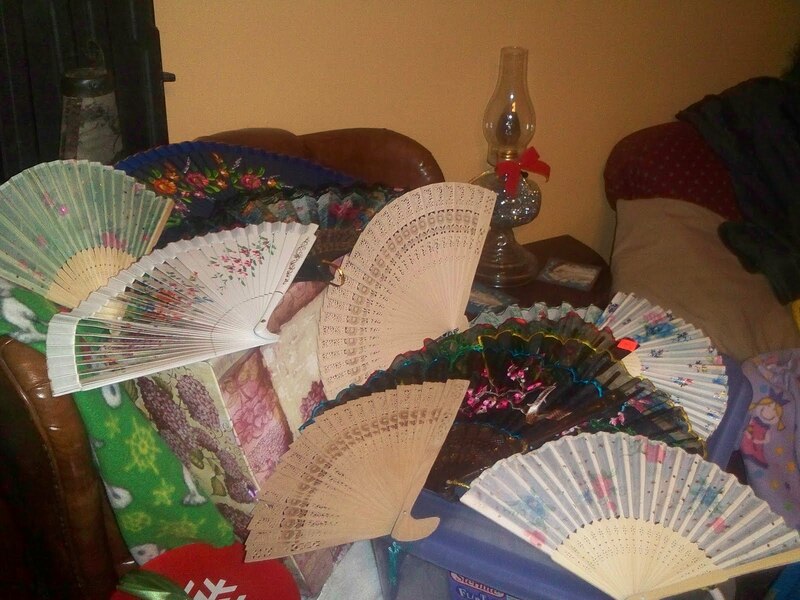 I went a little crazy buying fans. But you just can't get them here in Reno, especially not for the prices you can get them in Chinatown. And when you are dressing people for balls, fashion shows, and other events, it's awesome to have nice but inexpensive fans (that match the outfits) to let people use.